I presented and moderated what turned out to be a very vibrant discussion last night with the HubSpot User Group at HubSpot’s headquarters in Cambridge. As I was hit up several times with the inevitable question “can we get the slides?”, here they are below, as well as a link to an earlier post that formed a big chunk of the content: Stop debating Inbound vs. ABM and starting integrating your marketing (& that means with sales too). Inbound Marketing & Account Based Marketing - HubSpot User Group from Bedrock Data, Inc. It was interesting that in the course of the conversation, we had group members talk about their effective use of marketing channels such as events, direct mail and online advertising. In the “early days of Inbound”, the narrative -- or at least how it was internalized by many -- was that Inbound required an exclusive commitment to prospects finding you, and not the other way around. Marketing channels such as these, were the enemy. It’s good to see that many Inbounders are now realizing the vision of Inbound as a centerpiece for a marketing program, but rounded out with marketing channels such as events, direct mail and advertising. The key is that you can still be helping people through these marketing channels - providing you are delivering the right message to the right audience. These marketing channels can amplify inbound and are not the enemy. The key point here is that don't define Inbound as a marketing channel (being 'discovered' through search), but rather an approach ('helping people'), and if you apply the approach of helping people to marketing channels such as events, direct mail or advertising - you can make those channels successful for you. One group member noted events are their top performing marketing channel (and we’ve also seen it as a key producer at Bedrock Data). I also took the group through the power of relevant, well targeted advertising and how it can serve to ignite inbound marketing as the intersection point between ABM & Inbound. This is a corollary of point #1 – with marketing channels blending and inbound not being defined as an exclusive marketing channel, but rather a mindset or a movement, it’s this movement and alignment between like-minded professionals that will be the lasting impact - centered around helping people through marketing. There’s no other movement in marketing that can fill 17,000+ professionals at an event like Inbound did this past September. It's also what sets Inbound apart from other "movements", including account based marketing. The highlight of the experience for me was the awesome group discussion this topic prompted. Great questions – great answers coming from other group members. I didn’t see a single person on their phone (except live tweets), and in fact we ran overtime and everyone stayed, butts in seats. “Yes we do,” they said – one was the marketer, one was sales, I believe. Got “Yes we do” to that as well. Mark Goloboy then jumped in with the advice, “The best thing to do then is just get started.” Absolutely! One of the hot topics of Q&A was input on #NoForms (speaking of movements, the hottest one around marketers). Accelerating the typical back-and-forth with the “contact sales” leads and getting those engaged with sales immediately (and not running the risk of having competitors respond faster than you). The web visitor who has questions and “wants to remain anonymously”, but getting them comfortable enough to share their information through a chat exchange – and often that these folks on your website, learning, because they have been directed there by a boss or colleague. And once again it comes back to - helping people. For those who attended (or didn’t) – great spending the evening with you and let’s keep hanging out on LinkedIn or Twitter. The loudest voice in the marketing stratosphere is usually the marketing software vendors. Unfortunately that means a lot of brain cells are often spent on solving a problem that isn’t the most important problem for you, the marketer, to solve. To witness - the debate on Inbound Marketing vs. Account Based Marketing, or some variation thereof. The HubSpot team literally wrote the book on Inbound Marketing and since then has positioned outbound as the antagonist (or at the very least, a non-performer). This 23 Reasons Inbound Marketing Trumps Outbound Marketing lays out their position, originally published in October 2011. Engagio has since come along with their Account Based Everything positioning, which is basically: it’s all about aligning around the customer, but it’s more than just marketing it’s about all departments and functions (hence, the “Everything”). The Engagio team, which is the best & brightest from Marketo, have not been shy about knocking Inbound Marketing towards the betterment of ABE or ABM. 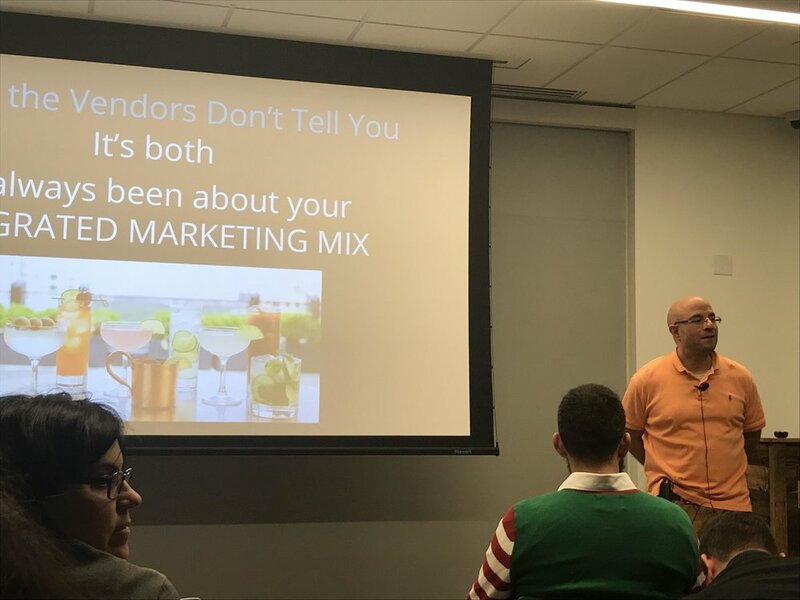 You’ll see the phrase “Drunk on Inbound Marketing” suggesting Inbound Marketing is not effective or poorly applied and misused as part of the case for Engagio, in outlets such as Ray Carroll’s “why I joined Engagio” piece to Jon Miller’s talk at B2B MarketingProfs last year. I have massive respect for Jon & Ray, so this is merely included as background example of the “us vs. them” that has creeped into the Inbound & ABM conversation at times, no knock on them. I’m here to not only advocate for ABM + Inbound together, as an integrated marketing approach, but bringing five specific ways you can use ABM + Inbound together. Let’s also debunk the myth that it’s either-or. Because even if the heyday of the Inbound movement, HubSpot still had outbound in their mix. I mean, c’mon, they cold called me on my cell phone in October 2014! Which led me to say this. I realize that's a little mean but scroll up and remember they built a business on "Outbound" being the bad guy. But it's still part of their marketing mix. I'm a HUGE fan of HubSpot - both the company and the product - so my Tweet from 2014 was more a reaction to outbound tactic being in conflict with everything they were positioning at the time that inbound was the only marketing strategy. And if you still aren’t convinced that it's not Inbound or Outbound or ABM only -- it's Integrated -- just search “Outbound Sales Manager” “HubSpot” on LinkedIn. Yes they had/have one. Good guy too. So now that we know that Inbound and ABM have a ton in common, and that they aren’t polar opposites never to be mixed, let’s get to it - 5 Ways to get Inbound & Account Based Marketing Working Together. Any criticism of Inbound marketing is rooted in companies misapplying the strategy. If your content is aligned to issues your buyers care about and how you ultimately help them solve those problems, then the buyer interest generated from inbound marketing will be effective. Companies should develop content that is aligned to target accounts - their problems, challenges and buying questions. For larger companies, this means that the content team needs to work closely with the account based marketing owner and/or sales team. Interview customers and sales reps to gather this insight. If they are part of the input process for content strategy, then by definition the content produced will be more likely to be utilized with target accounts and in attracting attention from those accounts and similar accounts. Don’t be this content team (cartoon credit to the great Marketoonist Tom Fishburne). The simplest thing ever is a natural bridge from inbound to ABM. If you have target accounts engaging on your website, let your sales reps or SDRs who own those accounts know about it. There have been tools to identify accounts on your website for over a decade - LeadLander was founded in 2004. There’s a slight tweak though to make this something that will help sales: remove the noise. However you choose to provide this intelligence to sales - and there are a slew of options from email alerts, to reports, to custom applications - don’t include “general interest” engagement. If a prospect is on your website reading an educational blog, categorize that differently (more of an FYI). For the real good stuff for sales, identify web pages that align to some level of purchase intent - they are looking at topic XYZ, which probably means they are in the early stages of something brewing at the organization. If you keep this insight focussed, it will maintain high credibility, and you’ll help motivate the sales team on how to engage in those accounts. Plus, if the sales team has been proactively prospecting to the account, it will be both satisfying and motivating to them to know that something is going on “on the other side”. And they can tailor their next steps based on topics of interest expressed by the prospects. Taking this one step further, the tactics often associated with ABM (outreach via email, phone, direct mail, online advertising) can be coupled with the identification of accounts engaging on your website through an initial inbound touch. For website visitors, you can identify the account of that visitor (even if they have been an ‘anonymous’ visitor), and then identify specific contacts aligned to your persona using skills or titles (and informed by the topics of content they viewed). You can then orchestrate retargeting and outreach aligned to the initial content topics they have consumed. If you are asking - what’s the difference between this and traditional “remarketing”? Remarketing is limited only to that specific individual and their cookied web browser. This technique would retarget the entire account, based on your ABM strategy of role-based content, and use multiple integrated marketing channels. Because when it comes to driving results - multi channel touches absolutely matter. The more your prospect sees you, the more of an impression, literally, you will make. Another misnomer of inbound marketing is that it came with a “if you build it, they will come mantra”. Part of inbound marketing or content marketing is engaging with influencers and social media to promote and amplify your content. I take that one step further to leverage target account advertising to drive engagement to your content. I view entertaining and relevant advertising, linked to quality content as an extension of inbound marketing. It’s helpful to your buyer if it’s well targeted and contextual. 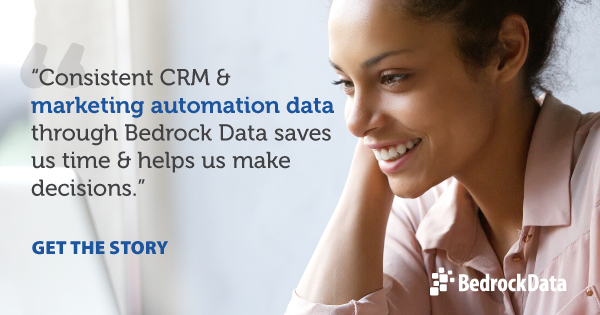 Here’s an example of a Bedrock Data targeted ad (companies with traditionally challenging marketing automation & CRM integration pairings) linking to an interview with a subject expert. Tying it all together by going back to #1, if produced the right way, then the same content you produce for inbound (not all of it, but a sub-set, and individual elements) should be useful for your sales team. Enable sales people to use the content (which remember, they had input in the topics for relevance to prospect) so it can be used on a 1:1 basis for account targeting, people map expansion & opportunity development. An example of this may be a customer interview snippet where a customer speaks to a specific approach they took to solve a problem, with universal insight. Maybe it’s a video clip, maybe it’s an audio clip, maybe it’s just a call out quote on a graphic. These kind of assets can be leveraged by salespeople in an account targeted approach, just as they are used to provide educational, not product specific content to fuel inbound marketing and SEO. This is where you get immediate payback on Inbound Marketing. I recently spoke on this at an Engagio user group and will be discussing live at a HubSpot user group on November 28. Missed it? - Check out the recap here. Let’s talk about these and other ideas, and how to incorporate both Inbound & ABM in your integrated marketing. These are 20 loosely connected takeaway from a day at the #FlipMyFunnel Boston 2016 event yesterday. 3. Although for comparison sake this is way, way behind Inbound – and not measured by scope or size, just purely on the passion of the practitioners. This will be key for #ABM going forward is to transfer the passion you hear from Sangram and Jon Miller to the customer/practitioner level. 4. ABM is at the “vendors driving it” stage of adoption. 5. Which begs the question, are all of these vendors eating their own dog food? Are they practicing ABM? Because the tipping point for both Marketo and HubSpot was leveraging their own products to drive growth. Which of the ABM vendors will do the same? 6. Certainly seems like InsightSquared is because they seemed to be the case study for half of the vendors -- which is great marketing for them! 7. ABM means different things to different people – in spite of the good work of the folks at Terminus, Engagio and others in defining frameworks. 8. There are a lot of companies who could benefit from an ABM approach where this is not even on their radar screen. 9. ABM is a great landing spot for post marketing automation stars. Lots of ex Marketo, Eloqua, Pardot faces and names. 10. Engagio has a great approach to ABM metrics. A key tipping point for ABM adoption will be when marketing organizations (along with sales peers, executives and finance) adopt those metrics as their KPIs. 11. In my view the crux of ABM should be on driving customer acquisition. In Jon Miller’s own words, he turned to ABM when he realized Marketo’s demand generation couldn’t scale to support the enterprise. This is the problem that needs to be solved – how companies can most effectively dovetail outbound marketing with inbound marketing to drive customer acquisition and demand generation growth. 12. This is why the EMC case study missed the mark for me. This was centered around a massive organization managing a relationship with other massive organizations. I don’t consider that to be the heart of the #ABM and #FlipMyFunnel movements that Sangram and Jon are evangelizing. 14. I agree with Jon that “Account Based Everything” stands out from “Account Based Marketing” because the whole point of the account-based approach is to create cross functional alignment across an organization. In Jon’s words, “ABM perpetuates marketing silos”, and words do matter. 15. There are a ton of technologies out there. Ton. Integrating a common view of the customer is a challenge for everybody. Exciting how Bedrock Data can help here. 16. Stat of the day from SalesForce State of B2B Marketing Study 2016 via Vala Ashfar: high performing marketing teams are 14X more likely to have integrated their business systems for a single view of the customer. A big part of the value Bedrock provides. 17. Personal highlight for me was meeting Scott Brinker, ChiefMarTec himself, for the first time. Have an exciting upcoming collaboration with Scott. 18. Good also seeing Jeff Coveney, Matt Benati, Tim Ceruto, Charlie Liang, Gar Smyth, Shaun Pinney, Chris Rudnick, Adam New-Waterson, Aaron Dun, Samantha Stone, Matt Heinz & Matt Senatore. 20. I’m really bad at naming my favorite song (you might see this in an upcoming video series from Jeff Coveney, although hopefully that gets chopped in the video edit). Hopefully I did a better job on data and ABM questions though. Ten Truths about Inbound Marketing vs. Account Based Marketing – What’s the Same, What’s Different and How Do They Work Together? The topic of this post comes front and center with news that The Inbound Marketing Company HubSpot is investing in Terminus, a key player in Account Based Marketing and the originators of the #FlipMyFunnel event series. With forthcoming product integrations, it also represents a marriage of sorts between #MarTech & #AdTech, top of mind for me following conversations at last week's MarTech Conference in San Francisco. Inbound Marketing and Account Based Marketing are usually seen as opposite sides of the spectrum of B2B demand generation strategies – but in reality the two have much in common and complement each other well. The best Inbound program benefits from Account Based Marketing (or similar targeted outbound strategies) to feed short-term demand until Inbound results are realized, while the best Account Based Marketing programs will leverage key principles of Inbound Marketing. With that in mind, I present Ten Truths about Inbound Marketing vs. Account Based Marketing, to understand the differences, the overlap and how they can work together for scalable demand creation. The main business rationale behind an Inbound Marketing strategy is significantly reducing cost per lead and customer acquisition costs. Account Based Marketing on the other hand says that there is value in investing more resources and program $ to build more in depth and targeted programs that puts a premium on a very specific target audience. #2 - …. So therefore Inbound Marketing is attractive for companies with a lower average order value. For this reason, businesses whose economics demand low customer acquisition costs based on their AOV should strongly consider the merits of what an Inbound Marketing strategy can deliver. The threshold for this will depend on multiple factors including the company’s ability to invest $ and resources for a long term payoff; I’ve generally considered the thresholds for Inbound vs. Account Based marketing as the leading strategy to be somewhere between $10-20K average order value for licensed software or $1-2k/month recurring for SaaS software. #3 - Account Based Marketing should yield higher conversion rates through each step of the marketing funnel. Both account based marketing and inbound marketing make strong cases for their method to yield strong conversion rates through the marketing funnel (e.g. MQI to MQL, MQL to Opportunity, Opportunity to Win). Account Based Marketing suggests that a highly targeted audience will yield high conversion rates because there is full alignment with sales that this account is one who has a strong fit for your product or service. Meanwhile Inbound Marketing suggests that conversion rates will be strong because a prospect who comes to you will be already educated and more ready to accelerate through their buying process. A counter-force on Inbound Marketing conversion rates however is that inbound marketing casts a wider net such that a lower percentage of leads will be in your true target profile. So for that reason conversion rates should be higher on the Account Based Marketing side. #4 – The impact of Inbound Marketing is on a longer time horizon than Account Based Marketing. Inbound Marketing is not the right strategy to drive short term results – if you are looking at driving results say within a 12-month time frame, temper expectations on Inbound and ensure there are other demand strategies to complement it while the Inbound tailwind can be built. That said, Account Based Marketing isn’t an overnight fix -- as strategies, data, assets and programs need to be developed -- but in the category of expected timeframe for impact on Pipeline I’d rank Account Based Marketing a step ahead of Inbound. #5 – Both Inbound Marketing and Account Based Marketing require a tight definition of target audience. Now we get to some of the key attributes these two approaches share. A tight definition of target audience is critical to success for both. In the case of Inbound Marketing, this is a market segment (usually defined by a set of people – roles, within certain types of companies) for whom there is an opportunity for the business to develop a stronger community within that segment with their brand as a central resource. Being crystal clear on that audience is a prerequisite to success. And in the case of Account Based Marketing, working with Sales to define a set of target accounts for whom your product/service can offer significant value is a key input to build demand. #6 – Both Inbound Marketing and Account Based Marketing require an in depth understanding of how customer’s buy – the customer buying process. It’s more than just knowing who you want to target – and in the case of both of these a truly winning strategy will be differentiated by just how well you understand (and have aligned your go to market team) around how and why customers buy. In the case of Inbound, these insights will inform what questions customers need to answer for every step through their buying process – starting with the awareness phase of just getting to understand their problems and then why it’s important to change. This content and the way it’s architected to nurture buyers through their buying process will be what creates scale and velocity for the Inbound program. In the case of Account Based Marketing, understanding the buying process, the roles involved and how they interact – will be key for both breaking through the clutter and getting the attention of that company. And then once engaged, this will also be key for creating velocity through the buying process, by engaging the various roles to ensure they understand problems they are facing, how they are relevant to them and how to address most effectively. #7 – High quality, relevant content is crucial to success for both Inbound Marketing and Account Based Marketing. No matter how you cut it, high quality content will be required for both. In the case of Inbound, it’s the content that serves as the bait to attract your audience and move them through the buying process. The exact same principles apply to account based marketing – there is just typically more investment applied to attract the attention of that audience to initiate awareness vs. relying on them to find you when they are ready. #8 – Both Inbound Marketing and Account Based Marketing require close alignment with Sales to be successful. Another must-have for both. Inbound Marketing is more than just generating that inbound lead – it’s every step through that buying process to ensure buyers are accelerated through their buying process. Alignment with sales is critical both around expectations for the time horizon for the impact of Inbound and how to most effectively engage Inbound leads. In the case of Account Based Marketing, alignment on who to target and how to engage them is a fundamental – the premise is hyper-targeting will yield overall efficiencies and pay off what will be a higher cost per lead. #9 – Companies employing an Inbound strategy, should look to complement that with an Outbound strategy (that may or may not involve the extreme of account based marketing) to drive demand while Inbound impact develops. Here’s the rub. For those companies employing an “Inbound First” strategy, there’s a time horizon, often more than a full year associated with seeing meaningful results – so ways to leverage their inbound content through outbound programs such as account based marketing or similar will be crucial to drive short term demand. #10 – Companies employing an Account Based Marketing strategy should leverage “Inbound principles” for account based success. And likewise Account Based Marketing success will require many of the same principles of Inbound Marketing –in fact much of the content one creates for an Inbound marketing strategy can be applied and leveraged for an account based marketing strategy – while it doesn’t “speak to the account” it will be effective in speaking directly to that role/persona through each stage of the buying process. For more on the interplay between these two strategies, see my article “When Inbound Marketing Isn’t Enough”.